We are excited to announce the 2nd Season of #ClassicsInThePark will begin on Jan 27th at Akola Boni Park, Accra. We will screen Kwaw Ansah's 1980 classic 'Love Brewed In The African Pot' and the Short Films 'Obeiro' by Nnenna Onuoha and 'Mother Tongues' by Victoria Adukwei Bulley. 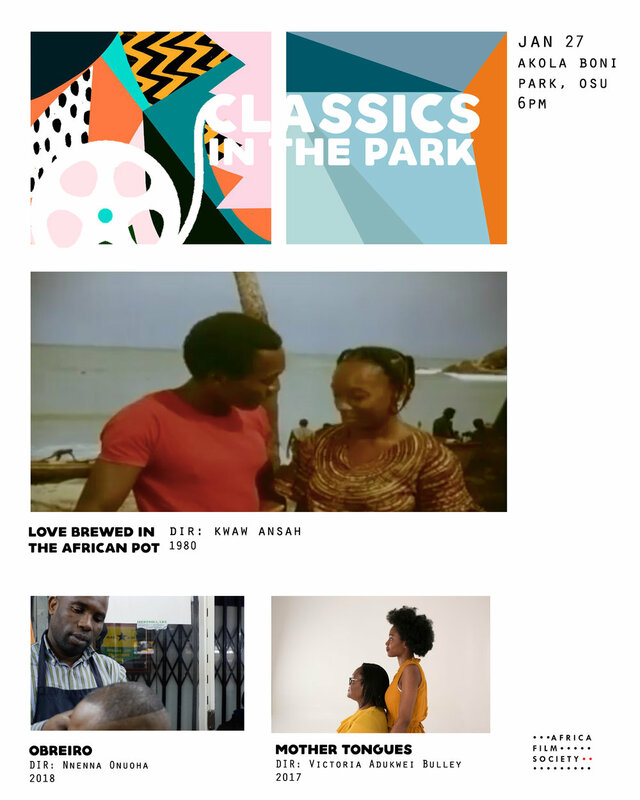 Africa Film Society is proud to announce our 2nd Season of Classics In The Park will feature a selection of short films from contemporary African filmmakers on the Continent and in the Diaspora. Our call for short films submission is now open. Below are Eligibility and Submission Guidelines. 1. Short-length (under 20 minute) narrative, documentary, animated and experimental films. 2. No Submission Fee required. 5. ALL territories and countries are eligible. Director or Producer of film MUST be of African descent. 6. Only one film submission per applicant. Africa Film Society’s free outdoor ﬁlm showcase ‘Classics in the Park’ will showcase African Animation for its Season Finale. Slated for April 29th, 6pm at Akola Boni Park in Osu, our 8th edition aims to reacquaint Ghanaian ﬁlm audience with 1998 cult classic Kirikou and the Sorceress. We will open screening with Ghanaian animated short film Agorkoli (2014) by Francis Yushau Brown. Arguably Ghana’s most accomplished filmmaker, Kwaw Ansah has remained for decades, the face of Ghanaian cinema. His debut film, Love Brewed in Africa Pot (1980) captured the imagination of a young nation with its cynical and often melodramatic take on love and classism. His second film, Heritage Africa (1989) was even more audacious. Heritage Africa won the grand prize at the 11th Panafrican Film and Television Festival of Ouagadougou (FESPACO) in 1989. Classics In The Park is honored to screen Heritage Africa, followed by an in-depth conversation with Kwaw Ansah about his film journey. Africa Film Society’s free outdoor film showcase ‘Classics in the Park’ will pay tribute to legendary Senegalese filmmaker, Ousmane Sembène for its 6th Edition. Slated for February 25th, 6pm at Akola Boni Park in Osu, Nyaniba Estate, this edition aimsto familiarize Ghanaian film audience with the works of the man considered to befather of African cinema through his 1975 film Xala and 2015 biographical documentary film Sembène!. Largely self-taught, Sembène was a prolific writer and director. His films and literature provide candid portrayal of Colonialism and the fallings of religion and the new African bourgeoisie. His first feature film, Black Girl (1966) is a critical account of the isolation of a young Senegalese domestic servant working with an affluent French family in Antibes. In Xala (1975), Semebène takes on the new African bourgeoisie in a biting satire about a westernized black bourgeoisie rendered impotent on the day of his wedding to his third wife. It was screened at the Moscow International Film Festival in 1975 and was ranked among ‘The 100 Best Films of World Cinema in 2010 by the Empire Magazine. Sembene was a member and co-founder of the Senegalese Association of filmmakers and the Pan African Federation of Filmmakers (FEPACI). He was a jury member at Cannes in 1967, Berlin (1977) and Venice (1983).His film, Moolaade (2002) won the Certain Regard prize in Cannes in 2004, subsequently becoming the first African director to hold a leçon de cinèma there. He died in June, 2007 at the age of 84. In 1970 a Ghanaian filmmaker, Nii Kwate Owoo (pictured below holding African doll -You Hide Me), went to the British Museum and managed to get access to the basement where he discovered boxes and plastic bags containing stolen African cultural treasures for which he produced the documentary YOU HIDE ME, to expose the stolen pieces. He brought the film home to Ghana in 1971 and the Ghana Broadcasting Corporation refused to air and banned the film with the fear of embarrassing the British. It became a major controversy internationally, after an article was published in the famous WEST AFRICA weekly news mag. Only a few people have seen this film in private screenings. Africa Film Society is therefore privileged to publicly screen this film at the monthly #ClassicsInThePark on Saturday Jan 28, at Akolaboni Park [Osu Ako Adjei]. The legend Nii Kwate Owoo will be at the screening to share his experience and answer questions, he is also the co-Director of the classic AMA movie. This is your invitation to see these films. It's a must. Akola Boni Park 6pm. Osu, Accra. TELL DE STORY OH!